1. Father and child adventurers can find out how to emulate Bear Grylls, one of the world’s most renowned survival specialists at a 24-hour survival academy on Dartmoor! 2. For petrol-head fathers, drive over to BHP Fuel Fest this June 18th-19th to get up close and personal with vintage and classic cars & motorbikes, live shows and static displays throughout the day, as well as trade stands, children’s entertainment and a food village, the entire family is provided for. 3. 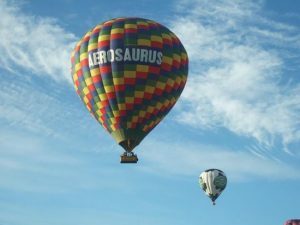 Take to the skies with a Hot Air Balloon flight from Exeter or Tiverton with Aerosaurus Balloons. Take an unforgettable flight over the beautiful Devon countryside and landing with a champagne reception. What a great way to treat Dad this Father’s Day! Flights from Exeter, Tiverton and the South West are available on request – call the booking office to enquire 01404 823102. 4. Head down to the pub for a pie and pint with your Dad to escape the rush! The Mill on the Exe is a spectacular pub in a beautiful location. 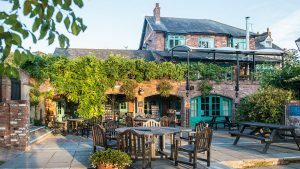 With tranquil waterside gardens next to Blackaller Weir and the Millstone footbridge, it’s easy to forget that the pub is only a stone’s throw away from the bustle of Exeter city centre. 5. For wildlife enthusiasts join the RSPB for a walk around the stunning Labrador Bay, enjoy the sea views of the south west coast path and keep your eyes peeled for gannets!